Here are our top 5 reasons why organic is a good choice to feed you and your family. But don’t just listen to us – we’ve included a selection of the best videos and articles from around the world. Buzz words are everywhere in the food industry. 100% natural, healthy, eco-friendly, superfood. They were all invented by clever marketers, and have no clear definition or regulatory standard. And importantly, you can’t just decide to become organic overnight. It takes a minimum of 3 years to convert an ordinary farm to a certified organic farm. That’s how long it takes to flush out all the bad stuff. 100% of Bellamy’s products are dual certified by two Australian certification bodies, ACO and NASAA. These bodies audit every step of our production chain, from farming through to packaging, to ensure we keep our organic promise. But traces of these toxic chemicals often find their way into our food. In a USDA study of over 10,000 conventionally grown fruits and vegetables, pesticide residues were found in over 75% of cases3. And that was after washing and peeling! 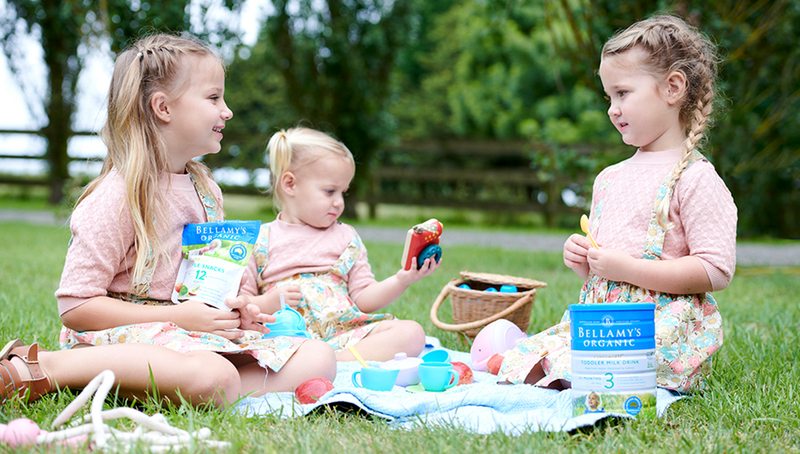 At Bellamy’s Organic, we prefer not to experiment on ourselves or our kids. We never use synthetic pesticides or fertilisers. Kids obtain much of their omega 3 through food sources such as oily fish like salmon and mackerel, and seeds like chia and flaxseed.1 But we all know these foods aren’t so appealing to fussy eaters! Why? Because organic cows are free to roam freely outdoors and eat fresh organic grass and hay. And they are fed absolutely no genetically modified grain, corn or soy. We like our cows to be happy, healthy and organic. And they reward us with tasty, nutritious milk. The secret to growing nutritious, tasty produce is… the soil. Conventional farming relies on synthetic fertilisers to supply nutrients to the soil. But organic soil is different. It is alive with an incredible diversity of microbes that break down organic matter like roots, leaves, manure, insects and earthworms. This process unlocks nutrients in the soil to make everything grow as nature intended. Animal welfare is central to the organic philosophy. Our dairy cows are raised in a more natural living environment, with continuous access to organic pasture, diets free from GMO grain and grain-concentrates, and without the use of antibiotics* and synthetic growth hormones. Organic farming is also kinder to the environment. It forbids the use of synthetic fertilisers and pesticides, and instead relies on the use of sustainable practices like composting, crop rotation, and cover crops. Do we think organic is worth it? Absolutely. Australia has 12.0 million hectares of Certified Organic land, nearly a third of the world’s 37.5 million hectares. This family doesn’t eat organic food because it costs more than conventional food and it just isn’t convenient.